FINANCIAL ECONOMICS RANKS AMONG TOP 5 AND RECOGNIZED BEST IN LITHUANIA AND THE BALTIC COUNTRIES. • All Programs are in the English Language. • All universities are Govt. or Govt. approved. • 20 hrs per week part time allowed after 1 year. • IELTS is not required if student speaks English. to be between 300-400 Euro. • Enjoy the quality of life and World class infrastructure. • Explore the culture and hip in capital city Vilnius..
• About 8000 Bachelor & 2000 Master degree students. education in Eastern and Central Europe..
• Exchange and double degree programs in 43 countries. • All lectures are held in English. Program offer in English only. • IELTS Not Required But Student should speak good English. 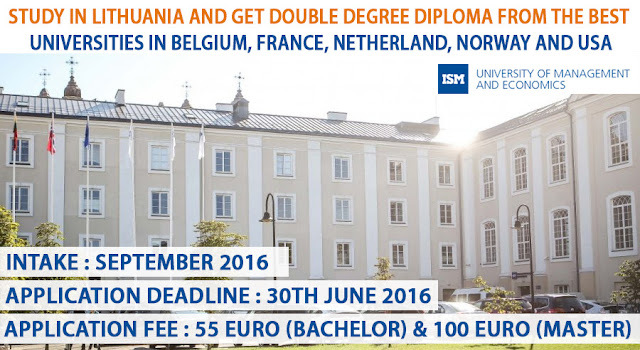 ISM University of Management and Economics was established in 1999 as the first private business school in Lithuania. The main founders of ISM are BI Norwegian Business School and Innovation Norway, a Norwegian governmental institution. Today, ISM is a fully-fledged University of Management and Economics with more than 1700 students enrolled in undergraduate, graduate, post-graduate and executive study programs. An International Quality Accreditation (IQA) awarded to ISM in 2006 by the Central and East European Management Development Association (CEEMAN), certifies that ISM. in Student account before visa application. • Students can stay back for 6 months on job serach visa after study. INTERNATIONAL MARKETING AND MANAGEMENT PROGRAMME RECOGNIZED THE BEST MARKETING STUDY PROGRAMME IN CENTRAL AND EASTERN EUROPE.